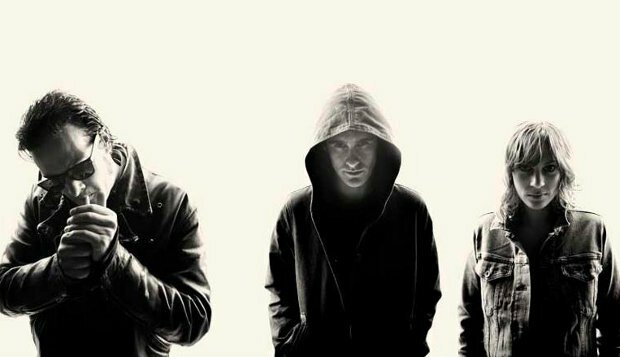 There is an undeniable feeling of heaviness in the air tonight at The Ritz as San Francisco alternative rock trio Black Rebel Motorcycle Club are about to begin a sold out gig in Manchester in promotion of their seventh studio album Specter At The Feast. At best, the new record has been a bare-all emotional effort for the band after the sudden loss of producer and sound engineer Michael Been, lead singer for the 1980’s new-wave band The Call, and father of BRMC’s bassist Robert Levon Been. Mentor and alleged “fourth-member” of the band, Been became the inspiration for Specter, having proven a dark and hard hitting LP since its release on March 18th 2013. I am nothing more than intrigued to see how the night will transcend with such weighty and morose tone bleeding throughout the tracks on the album. Glaring white strobe lights muffle through a smokey haze in The Ritz and support the keyboard ensemble opening to ‘Fire Walker’. The venue is congested from floor to ceiling with rock hooligans hanging off the balcony and dripping their overflowing drinks onto the unknowing crowd below. Being the avid gig hound that I am, watching the band from above distances me from the action of it all so I put up my elbows and push through a sea of black and leather towards the middle of the audience. ‘Red Eyes’ and ‘Whatever Happened To My Rock N’ Roll’ create an uproar of cheers and fists to the sky showing no such demise of entertainment or desistance from a band who has suffered through such a period of personal loss and recovery. With his hood up in a Grim Reaper-like state, Levon Been spins his hollow-bodied bass in the air to the tub thumping drums of ‘Berlin’ with the words “Somebody’s gonna hurt somebody” echoing off the stage. The utter devotion of this band’s massive Manchester fan base is self-evident as they begin chanting “BRMC! BRMC!” to the dimly lit Californian trio who are currently living up to the high expectations we were pledged. The hyper-powered yet brooding bass of ‘666 Conducer’ is followed by the recognizable hit ‘Love Burns’ from their debut self-titled back in 2001, highlighting the undeniable level of versatility of their twelve year run. The ambience of the set is levelled in a pensive way that seems fitting to the passing of Been Sr.”I’ll be standing with my dying bell / If you dare to come along” pleads guitarist Peter Hayes in ‘Fault Line’ during a two song acoustic and piano set which unappreciatively serves as a bar run for some of these more turbulent English fans. The defiant ‘Teenage Dream’ and melodic ‘Lullaby’ from Specter both fulfil a bittersweet cannon of drumming by Leah Shapiro, fading out an impressive twenty four song gig to an emotional double encore and ending with ‘Sell It’ and ‘Lose Yourself’. If the only aspect of tonight to come as a surprise is BRMC’s inadvertence to perform their newest single ‘Let The Day Begin’ which redefines The Call’s original with a refreshingly loaded guitar and the void of the synthesizer, then I truly have no complaints. The foundation of Black Rebel Motorcycle Club has always been layered with a sense of solemn disposition anyways, which is perhaps what we love so much about them. Tonight allowed us to relive some of the finer compositions from the BRMC collection and has opened the stitches to the deeper side of a band who I can thank for breathing a bit of life back into rock and roll.